Spider-Man: Homecoming is just days away from hitting theaters and Robert Downey Jr. has taken some time to reveal why Tom Holland was the only choice to portray Spider-Man. The early reviews seem to be echoing Downey Jr.'s praise, especially fans. Some have even called Spider-Man: Homecoming the best Spider-Man movie yet and that Holland is a perfect Peter Parker. These are pretty bold words when one considers that Tom Holland is the third person to portray Spider-Man in fifteen years. First there was Sam Raimi's trilogy starring Tobey Maguire and later Marc Webb cast Andrew Garfield for his two Amazing Spider-Man movies. Captain America: Civil War was our first glimpse at what Tom Holland could do as Spider-Man, but it was a pretty small glimpse compared to what we're about to see as Holland gets his own starring role in a movie. Robert Downey Jr. recently talked to News Corp Australia Network to compliment Holland and his abilities. RDJ explains. "Tom is the perfect man for the job. He's enthusiastic, bright and gifted, a very physically talented guy by virtue of his dance and acrobatic background." Holland has a pretty extensive gymnastics background and has certainly brought that talent with him while playing Spider-Man. Downey Jr. went on to say that all of Holland's talents make up the perfect combination to play a new version of the famous web slinger. Downey Jr. says this. "He has just the right combination of elements required to bring a new take on the character." It appears as if the feeling is mutual between Holland and Downey Jr. Holland has said many times that Robert Downey Jr. is the "godfather" of the MCU and just an all around good mentor on and off screen. While Tom Holland is just starting out with Sony and the MCU, Downey Jr. has been dropping hints that it might be almost time for him to hang up the Iron Man costume for good, "before it gets embarrassing." It's hard to imagine anybody else portraying any character as well as Downey Jr. took on Iron Man, plus he's been doing it for so long it's almost as if he is the real-life Tony Stark. It's inevitable that Downey Jr. will stop one day and somebody else will pick up the torch, but it could be sooner than later. Tom Holland has been out doing a ton of press to promote Homecoming and while he was on Good Morning America he revealed that he told the producers about his acrobatic background, even sending in videos of himself performing stunts. But apparently they never heard him because it wasn't until his first audition that they found out about his hidden abilities when he asked if they wanted to see him do a flip. It must have worked because he's now Spider-Man. Later in the Good Morning America feature, Holland shows off his dance moves with Backstreet Boy Arron Carter live on television. 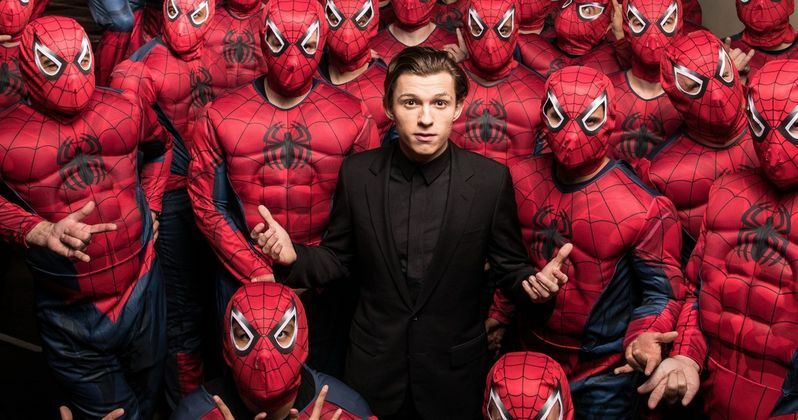 While young Tom Holland might not be able to keep his mouth shut when it comes to spoiling MCU secrets, he has the perfect "combination of elements" to put a new spin on Spider-Man. Whether Robert Downey Jr. decides to hang up the Iron Man costume for good is anybody's guess, but it could end up being pretty soon. Regardless, we can see Tony Stark mentor Peter Parker this week when Spider-Man: Homecoming hits theaters on Friday.